An earlier version of this was posted Oct 21, 2008. It has been edited slightly to reflect current conditions, but it is basically accurate still. The patient takes vitamins and minerals in doses recommended by most physicians, and gets plenty of exercise. The patient is mysteriously ill. Upon examination, it appears that the patient has been slowly poisoned. The patient’s immune system and general state of health might have been sufficient to cover the symptoms of the poisoning longer, except for the strain imposed by the recent hunger and weight loss. The symptoms have been coming on for sometime, but only recently have they become indisputable, as what seemed subclinical does of the poison accumulated in the tissues enough to cause big problems. Some physicians suggest simply stopping the poison immediately, engaging in a crash program to feed the patient, and growing lots more food for the future, starting today. The basically healthy patient’s immune system and generally good habits will reverse the effects of the poison. Some physicians suggest continuing the patient’s calorie restriction, cutting back on the vitamins and exercise, switching to a different poison (but reducing the dose) and using leeches to drain away the bad blood. When it’s pointed out that the vitamins and exercise are usually good things, and that poison is usually a bad thing, these practitioners assure the patient that the problem was an unexpected reaction between the nutritional supplements and the low grade poison dose, and the new poison is really a purgative to help clear the system of the effect of too many vitamins, and won’t do any harm. When these doctors are asked if the patient really shouldn’t be eating more, they say it’s good to be skinny, and research shows that skinny people live longer, anyway. They point to all kinds of studies that seem to prove all of this, and cite complicated sounding theories to justify the counter-intuitive nature of their prescriptions. Trust them: they’re the experts. And besides, even if the patient starts growing more food again, it will be many years before enough can be grown to adequately feed the patient (aren’t growing seasons usually annual things?). And even if the patient eats more, the patient will just start exercising more again, and burn the calories, and what good will that do? I know which advice I’d follow, if I was the patient. The patient, of course, is the US economy. The vitamins and exercise are the tax cuts put in years ago by the Bush administration and Congress. Strictly speaking, the vitamins are the tax cuts (think antioxidants that prevent cross-linking), and the exercise is the additional economic freedom those cuts created for productive activity that drove the huge success of our economy for six years after 9/11, until the combination of oil prices and the housing/financial meltdown drug it down about a year ago. The diet is oil and energy, and we don’t make anywhere near enough of our own, which is part of the reason prices were so high not long ago. Don’t be fooled! Even though prices have fallen far off the $150/barrel highs, oil is still in short supply for an active, vibrant economy. You can’t have a speculative bubble without an underlying “shortage,” and right now people are simply doing less that demands energy. But our access to energy is going to reflect itself in our ability to “rev up” the economy as we grow out of the recession. The combination of a true structural energy shortage for a vibrant economy, plus the inflation that is going to result from the printing of new money, is going to result in higher oil prices than we’ve ever dreamed of, within a relatively short time, as the economy improves, demand goes up, and the worth of money goes down. The mysterious poison (that “drug” we mentioned, the one with inevitably serious side effects) is government interference in the marketplace, particularly in trying to repeal the basic laws of economics. One of the main things that poisons do is to interfere with normal biological processes, and market interference is little different. There are many of these poisons, and when one of them is having an obviously negative effect on the patient, too many so-called experts suggest we try a different one. The problem is that all such interference is toxic for our economy. Some amount of government interference is probably inevitable; after all, we take medicines that are essentially poisons, because our overall organisms can handle it in small amounts, and the medicine sometimes helps resolve a short-term problem. But you will die young on a steady diet of high doses of all kinds of medicine, regardless of how beneficial some medicines are in short term use for very specific problems. A body can tolerate just a very few “maintenance” medicines for a long life, and they must have very mild side effects to be survivable. A few years ago I had some blood tests that revealed serious problems. My doctor couldn’t figure it out, and sent me to a specialist. He looked at the list of medicines I was taking, and simply took me off everything but the absolute minimum. My blood-work improved dramatically, as did my overall health. What had happened was “medicine creep”, where the doctor prescribes one thing, then another to deal with the side effects of the first, then another, then another, and so on. It took an expert to decide to do very little, while the mediocre practitioner tried to do too much. We are toxic with government economic medicine right now. The physicians who are prescribing it were wrong about the LAST ten prescriptions, with side effects they claimed we wouldn’t experience, and with frequent failure in the purpose of the medicine, even WITH the deleterious side effects. And they are planning to send us the bill for their professional services, anyway. The very best thing they could do is to withdraw all but the very minimum of economic medicine (meaning a tolerable toxicity), and let the body heal itself. It will. But our president and Democrat congress have big plans. They want to put us on about a dozen VERY STRONG maintenance medicines for life, medicines with serious toxic side effects, medicines that have not ever worked for any other patient over the long term, and send our children the bill. Unfortunately, instead of Hippocrates in office, we have hypocrites. Besides $500 tax cuts for most workers and $1,000 for couples, the Obama proposal includes more than $100 billion for businesses, an Obama transition official said. The total value of the tax cuts would be significantly higher than had been signaled earlier. The huge question, completely unaddressed by the AP in its report: what is the “starting line” from which the tax cuts will be calculated? Is the tax cut going to take the current situation, with the Bush tax cuts still in place till 2010 or so, as the starting line from which to do further tax cutting? Or are the tax cuts only to be calculated from the state of play after the Bush tax cuts expire? Keep in mind that it is the Democrats who have always called it a “cut” in spending when the actual increase in spending is simply reduced from what had been planned. Only in Washington DC Democrat-speak can you call it a “cut” when you’re increasing spending by 2% instead of 4%. Is this really going to be a tax “cut”? Or is this Dem-speak for less of a tax increase than they had planned? And is it going to be calculated from the lower tax rates in force under Bush? Does this mean the Bush tax cuts are going to be extended, with new cuts in addition? The AP may be forgiven for not having answers to these questions, but to pretend the questions aren’t there by ignoring them is risible. UPDATE: This report from the Wall Street Journal is more comprehensive but still does not mention the fate of the Bush tax cuts when their current authorization expires in a year or so. UPDATE: One of my more cynical emailers suggests that there will be NO real tax cuts of any duration (maybe very short term only), because he expects that the Democrats will let the Bush tax cuts expire shortly, so that they can take credit for “cutting” taxes that would stay lower if Democrats simply made the Bush cuts permanent. This seems possible to me, given the nature of Washington doublespeak. A blue collar man came home from a long day’s work to find his idealistic daughter had dropped in while doing some local community organizing. Like so many others in his income bracket, he considered himself to be a God fearing conservative, and along with most conservatives, was very, very much against income and capital gains taxes, especially on the rich. But today he was deeply worried about the economic future of his naive, liberal daughter and his two grandchildren. Based on stories his parents told him about the Great Depression, his own shallow prejudice, and selected morsels of misinformation fed to him by right-wing talk radio, he decided to confront her right there and then for her own good. He started by calmly and politely pointing out that Barack Obama was a Muslim, not a US citizen, and the President-elect was going to raise taxes on millionaires and force government funded abortions on everyone — even the men. Before the girl had a chance to respond to her father’s breathtaking ignorance, he muttered something about unions being responsible and trailed off. The girl, sensing something more was going on, asked him instead about his own job. McCain and Palin, plucky foes of spreading the wealth, must have known that such spreading is most what Washington does. Here, the Constitution is an afterthought; the supreme law of the land is the principle of concentrated benefits and dispersed costs. Sugar import quotas cost the American people approximately $2 billion a year, but that sum is siphoned from 300 million consumers in small, hidden increments that are not noticed. The few thousand sugar producers on whom billions are thereby conferred do notice and are grateful to the government that bilks the many for the enrichment of the few. Conservatives rightly think, or once did, that much, indeed most, government spreading of wealth is economically destructive and morally dubious — destructive because, by directing capital to suboptimum uses, it slows wealth creation; morally dubious because the wealth being spread belongs to those who created it, not government. But if conservatives call all such spreading by government “socialism,” that becomes a classification that no longer classifies: It includes almost everything, including the refundable tax credit on which McCain’s health care plan depended. Hyperbole is not harmless; careless language bewitches the speaker’s intelligence. And falsely shouting “socialism!” in a crowded theater such as Washington causes an epidemic of yawning. This is the only major industrial society that has never had a large socialist party ideologically, meaning candidly, committed to redistribution of wealth. This is partly because Americans are an aspirational, not an envious people. It is also because the socialism we do have is the surreptitious socialism of the strong, e.g. sugar producers represented by their Washington hirelings. The power to tax, in any amount, for any purpose whatsoever is at the root of the corruption of the American ideal. The founders understood this, and carefully limited what Congress could do. But Amendments since then, put in place by a people with less wisdom than the founders, have allowed essentially unlimited taxation of anyone for any purpose, limited only by what is politically feasible, and does not produce immediate economic disaster (long term disaster being just fine, it seems). We may be about to find out, the hard way, exactly what those limits are. I am afraid that, for a majority of Americans, their main aspiration may be to acquire the objects of their envy, by any means necessary, except actually earning them. 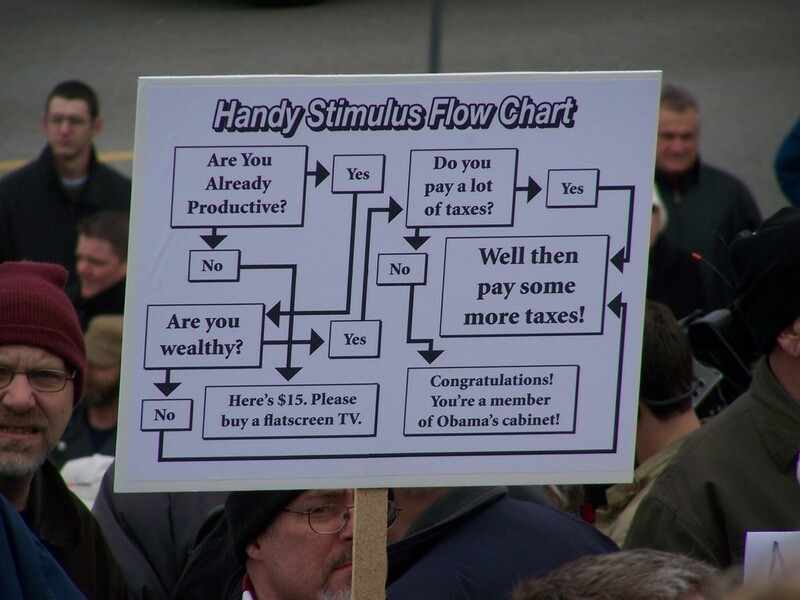 Here is a handy guide to Obama’s tax promises, based on an Urban/Brookings study, posted at the CATO Institute. Either Republican Senator John McCain or Dem­ocratic Senator Barack Obama will have to make very important decisions on tax policy when he takes office in January 2009. First, the U.S. econ­omy will be recovering from the financial crisis and is already predicted to grow less than its usual rate of 3.3 percent over the last 50 years. Second, Pres­ident George W. Bush’s tax cuts will expire in 2011, and the President must decide how to extend or make permanent some of the tax cut provisions. Senator McCain will make the Bush tax cuts per­manent, with the exception of the estate tax. McCain credited the Bush tax cuts with helping the economy recover after the 2001 recession. Senator Obama, on the other hand, will extend the Bush tax cuts only for those taxpayers who earn less than $250,000 a year—he has deemed the rest of the people “rich.” Senator Obama will also enact new tax increases on these rich individuals as well as a series of targeted tax credits for lower-income indi­viduals. Senator Obama believes that the current tax system is not progressive enough and that higher taxes on the rich should be used to give money to low-income individuals or those who do not work at all, such as retired people, reduce the deficit, and reduce the size of Social Security’s shortfall. In other words, Obama isn’t planning merely to return to the higher taxes under Clinton for “the rich”, he plans to tax them even MORE than Clinton’s Democrat congress voted in 1993, when Clinton “discovered” that he couldn’t keep his campaign pledge to lower taxes for the middle class after all. One can’t help but wonder if Obama will discover that “the rich” are those making more than $50K-$70K per year, when his staff really crunches the numbers. Those windmills are going to be expensive. The patient is mysteriously ill. Upon examination, it appears that the patient has been slowly poisoned. The patient’s immune system and general state of health might have been sufficient to cover the symptoms of the poisoning longer, except for the strain imposed by the recent hunger and weight loss. The symptoms have been coming on for sometime, but only recently have they become indisputable. So: in ALL of Obama’s discussion of his plans to raise taxes on only the top 5% in income, and “cut” taxes for the other 95%, how much have you heard about his plans to allow the expiration of the Bush tax cuts? Does he mention those tax cuts were across the board, so that EVERYONE who paid taxes got a tax cut? From where I sit, letting a tax cut expire is about the same thing as raising taxes. Has he explained why it’s better for the “working class” to get a tax cut (or just an outright check for $1000 or so from the government for the 40% who pay no income tax) than it is for the same people to have a secure job in a growing economy? And the great probability that his tax raise on the top 5% will SLOW or STOP growth altogether, especially in the current economic situation? That his tax raise on the employer class is going to cause fewer jobs, because the money that would have supported more workers will go to the government, or employers will simply manage their situation to reduce activity in the USA, and thus reduce tax liability? Has Obama ever explained why HIS socialist leaning plans will work in the USA, when they’ve essentially failed in other nations, and are being replaced by more privatization? Has he ever mentioned that the tax on US business is among the very highest in the world, already? Has he ever mentioned the fact that when taxes are raised on business, they either cut jobs, or raise prices, or both? I still have not heard Obama suggest that he is willing to drop his planned tax hikes in the face of the economic downturn. I doubt you have, either. Obama claims his planned tax hikes will only affect the rich. It’s hard to tell if he’s simply lying, or simply ignorant, but no rational, honest person can believe that. Check this out.